Sweet To The Soul Ministries - What Is Hope? But for Christians, hope is the confident expectation, the sure certainty that what God has promised in the Word is true, has occurred, and or will in accordance with God’s sure Word. set your hope fully on the grace to be given you when Jesus Christ is revealed. He takes no pleasure in the strength of a horse or in human might. No the Lord's delight is in those who put their hope in His unfailing love. "For I know the plans I have for you", declares the Lord, "plans for welfare and not for calamity to give you a future and a hope." I wait for the Lord, my soul waits and in His word I do hope. have great confidence as we hold to the hope that lies before us. 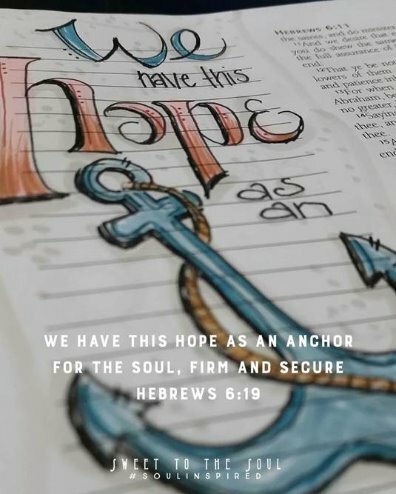 This hope is a strong and trustworthy anchor for our souls." ​Jana Kennedy-Spicer is a blogger, graphic artist, Bible teacher and speaker passionate about inspiring and encouraging women on their daily walk with Christ. This post is part of our new series #SoulInspired.